Dumbo is a 2019 American fantasy adventure film directed by Tim Burton, with a screenplay written by Ehren Kruger. The film is inspired by Walt Disney's 1941 animated film of the same name, based on the novel by Helen Aberson and Harold Pearl. 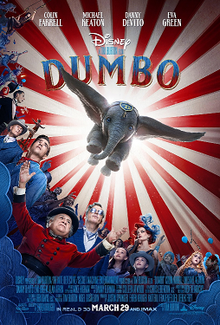 The film stars Colin Farrell, Michael Keaton, Danny DeVito, Eva Green, and Alan Arkin, and follows a family that works at a failing traveling circus as they encounter a baby elephant with extremely large ears who is capable of flying. Plans for a live-action film adaptation of Dumbo were announced in 2014 and Burton was confirmed as director in March 2015. Much of the cast signed on in March 2017 and principal photography began in July of that year in England, lasting until November. It is the first of five live-action re-imaginings that Disney is planning to release in 2019 along with Aladdin, The Lion King, Maleficent: Mistress of Evil, and Lady and the Tramp. The film premiered in Los Angeles on March 11, 2019, and was theatrically released in the United States on March 29, 2019. The film has grossed over $309 million worldwide, and received mixed reviews from critics, who praised the performances of the cast and Burton's signature style but criticized the screenplay and "lack of heart" compared to the original also saying it "didn't live up to its potential." In 1919, equestrian performer and World War I amputee Holt Farrier returns after the war to the Medici Brothers' Circus, run by Max Medici. The circus has run into financial troubles and Medici has been forced to sell the circus' horses after Holt's wife and co-performer, Annie, died from the Spanish flu outbreak, so Medici reassigns Holt as the caretaker for the circus' pregnant Asian elephant, "Mrs. Jumbo". Mrs. Jumbo gives birth to a calf with unusually large ears and Medici orders Holt to hide the ears before allowing the public to see the calf. However, the calf accidentally reveals his ears in his debut performance and the crowd mockingly names the calf Dumbo while pelting him with peanuts and other objects. Mrs. Jumbo is horrified. Enraged by her son's mistreatment, she rampages into the ring, causing extensive damage and accidentally killing an abusive handler during the tour in Joplin, Missouri. Afterwards, to prevent a public relations problem, Medici resorts to selling Mrs. Jumbo. Holt's son and daughter, Joe and Milly Farrier, comfort Dumbo and discover he can fly by flapping his ears. The children also discover that feathers are the key to Dumbo's willingness to fly. In another performance, Dumbo plays the role of a firefighter clown to put out a fire with water sprayed from his trunk, but the performance goes wrong and Dumbo is trapped on a high platform surrounded by flames. Milly boldly risks her life to deliver a feather to Dumbo, giving him the confidence to fly. The audience is astounded when Dumbo flies and word of his talent begins to spread. V. A. Vandevere, the entrepreneur and owner of a bohemian amusement park called Dreamland, approaches Medici and proposes a collaboration; Medici would become Vandevere's partner and the Medici Brothers' Circus' troupe would be employed to perform at Dreamland. Later, Vandevere demands that Dumbo should fly with French trapeze artist, Colette Marchant. Colette and Dumbo’s debut performance at Dreamland goes wrong with Dumbo nearly falling off a high platform leading to him trumpeting in alarm since there is no safety net. Dumbo hears his mother's call in response and realizes that his mother is in an exhibit elsewhere in Dreamland. Dumbo flies out of the circus ring, reuniting with his mother. Fearing that Mrs. Jumbo may become a decoy to him and ruin his reputation, Vandevere spitefully orders her to be taken away and killed. Vandevere also fires all the Medici performers from Dreamland. When Holt and the rest of the Medici troupe learn that Vandevere intends to kill Dumbo's mother, they resolve to set both her and Dumbo free. The circus performers utilize their various talents to break Mrs. Jumbo out of her enclosure while Holt and Colette guide Dumbo to fly out of the circus. Vandevere attempts to stop them, but accidentally starts a fire triggered by an enraged mismanagement of Dreamland's electricity system which spreads and destroys the park. After Dumbo saves Holt and his family from the fire, Holt, Colette, the kids, and the troupe bring Dumbo and his mother to the harbor, where they board a ship back to their native home in India. Afterwards, the renamed Medici circus is re-established (while it's implied that Vandevere is arrested and tried for arson through misconduct) and flourishes with Colette as the newest troupe member, performers dressed as animals, and Millie as host of a science lecture exhibit. Meanwhile, Dumbo and his mother reunite with a herd of wild elephants who applaud their newest member as he flies with joy for their future to come. Early development for a live-action adaptation of Dumbo began in 2014, when Ehren Kruger gave to Derek Frey a script for the film, which a touched Frey green-lighted for development. On July 8, 2014, it was announced that a film was in development for Walt Disney Pictures. Kruger was confirmed as the screenwriter, and Justin Springer would serve as the producer along with Kruger. On March 10, 2015, Tim Burton was announced as the director. On July 15, 2017, Disney announced Dumbo would be released on March 29, 2019. The film features a different storyline from the original film's, though as star Colin Farrell described, "[t]he one central thing that holds true in both the original animation, the original cartoon" is the film's message of "believing in yourself and finding something inside you that allows you to become the best version of what you thought you could even be, and that we're all, regardless of the things that sometimes society says, should arrive us at being outcasts; they're the things that make us all individual, special, and beautiful regardless of how crippling a certain thing may be or how polarizing a certain physical attribute even may be." The film does not feature talking animals, focusing instead on the human characters. Kruger wrote the script as a story that "offered a way to tell that story in a framework that expanded it, but without redoing the original [film]", as well as a story that "was simple, with an emotional simplicity, and didn't interfere with what the basic through line of the original is about." Like the original film, Dumbo depicts the character as a symbol of someone who does not fit and turns his disabilities into an advantage. Kruger wrote the script in order to "explore how the people of the circus world would relate to Dumbo's journey", while Springer said that "[the production team] really wanted to explore the human side of [Dumbo's] story and give it historical context. In the animated feature, Dumbo flies for the world at the end of the film. [They] wanted to find out how the world reacts when people learn that this elephant can fly". In January 2017, it was announced that Will Smith was "in talks" to play the father of the children who develop a friendship with the lovable elephant after seeing him at the circus. However, Smith later passed on the role due to scheduling conflicts in his filming for Bad Boys for Life, among other reasons. Smith went on to be cast as the Genie in Disney's live-action remake of Aladdin. Bill Hader, Chris Pine and Casey Affleck were also offered the role, but passed on it before Colin Farrell was cast. Farrell, a fan of Burton, chose to work on the film because "[t]he idea of [acting in] something as sweet and fantastical and otherworldly, while being grounded in some recognizable world that we can relate to, under the direction of [Burton], was a dream ... I’ve always been looking for something of that ilk.”"
In March 2017, Eva Green and Danny DeVito, recurring collaborators of Burton's, joined the cast as Colette, a trapeze artist, and Max Medici, the circus' ringmaster, respectively. Due to her fear of heights, Green trained with aerialist Katherine Arnold and choreographer Fran Jaynes in order to prepare for the role. In April 2017, Michael Keaton joined the cast, rounding out the few prominent "adult" live-action roles. Tom Hanks was reportedly in discussions for the role before Keaton was cast. During the summer of 2017, DeObia Oparei, Joseph Gatt, and Alan Arkin joined the film. DeVito said that "[he loves] Tim and [he] would do anything to be in a movie with him." DeVito said that Burton is "[a]lways spirited, always an artist, always thinking about the craft, always painting with his mind" and that he felt like "part of some kind of palette, a color scheme" while filming the movie. Principal photography had begun by July 2017, in England. Two elephant props were used during filming "to give [the production team] an idea of his size and his shape in the scene; an idea of the lighting, and that kind of thing; where he's going to be for camera." Creature performer Edd Osmond used a green suit to represent the character while filming certain scenes, as well as an "interactive reference" for scenes that required the actors to be in contact with the character, and as a guide for Burton to use, with Burton later providing information of his performance to the animation team. Unlike most remakes of Disney's animated films, Dumbo mostly used practical sets during filming. Most of the filming was done at Pinewood Studios and Cardington Airfield in England. Production designer Rick Heinrichs designed the film's scenes in a way that represents both the film's story and the period it is set, stating that the film's story "provided a very specific period, but at the same time, having worked with Tim many times in the past, [he knows] that [Burton is] a little less interested in giving a history lesson as he is in the emotional story being told." Both the "Dreamland" and circus scenes were designed differently in order to showcase their contrasts. The production design crew were heavily influenced by the works of Edward Hopper, with Heinrichs stating that the team tried to create something similar to "[Hopper]'s reductive process of looking at environments and reducing it to its essence." Heinrichs also said that the production design team had "to push the reality—the live action—a bit into the storybook world. [They] certainly make the baby elephant look believable, but [they] also stylized our world, pushing it into an expressive direction with all of the lighting, costumes, props and environments." Burton filmed the remake in sound stages, stating that "[f]or this kind of movie, shooting all indoors obviously helps with weather concerns and all those things. It's one movie where [they are] not sitting around, talking about the weather all day long." The production team also created a full-scale version of the train "Casey Jr." from the original film, though it was visually redesigned in order to reflect the circus' state. According to visual effects supervisor Richard Stammers, a motion base, which he described as "essentially a hydraulic round gimbal rig", was used for scenes in which Green's character flies with Dumbo, with hydraulic pistons used to simulate Dumbo's flying. On October 4, 2017, Danny Elfman was revealed to be composing the film's score. Elfman said that "[he and the production team] knew [they] would have to find a musical identity for Dumbo that was purely Dumbo." Elfman developed the film's main theme as "a very simple theme" as Burton "feels it's a simple story." Elfman also wrote background music for the film's scenes in the circus, as well as themes based on the characters' experiences. He also wrote a theme for Medici and Vandevere which he described as "a bit of a wicked thing." The score plays homage to Frank Churchill and Oliver Wallace's score from the original film. Norwegian singer Aurora performed a cover of the original film's song "Baby Mine" for the remake's trailer, though it was not featured in the actual film. Sharon Rooney performed the song in the film. Additionally, Arcade Fire performs an end-credits version of "Baby Mine" for the film, which was released as a single on March 11, 2019. Instrumental versions of the songs "Casey Junior", "When I See an Elephant Fly", and "Pink Elephants on Parade" from the original film are also featured in the film. The soundtrack, featuring Elfman's score and Arcade Fire's version of "Baby Mine", was digitally released on March 29, 2019, and will be physically released on April 26, 2019. All music composed by Danny Elfman, except where noted. Dumbo was released in the United States and United Kingdom in 2D and RealD 3D by Walt Disney Studios Motion Pictures on March 29, 2019. It held its world premiere at the Ray Dolby Ballroom in Los Angeles on March 11, 2019. The Japan premier was held in Tokyo on March 14, 2019. The France premier was held in Paris on March 18, 2019.The European premier was held at the Curzon Mayfair Cinema in London on March 21, 2019. It will be released in RealD 3D, IMAX, IMAX 3D and Dolby Cinema. Dumbo will be released to stream exclusively in Disney's upcoming streaming service, Disney+, in late 2019. The first trailer was released on June 13, 2018. The second trailer debuted during the CMAs on November 14, 2018. As of April 23, 2019[update], Dumbo has grossed $102.9 million in the United States and Canada, and $206.8 million in other territories, for a worldwide total of $309.7 million, against a production budget of $170 million. In the United States and Canada, the film was released alongside The Beach Bum and Unplanned, and was projected to gross $50–65 million from 4,259 theaters in its opening weekend. The film made $15.3 million on its first day, including $2.6 million from Thursday night previews. It went on to debut to $46 million. The film topped the box office but was considered a disappointing start given the $170 million budget and Disney brand, with Deadline Hollywood putting the blame on the original film being 78 years old and the middling critical response versus poor marketing. In its second weekend the film dropped 60% to $18.2 million, finishing third behind newcomers Shazam! and Pet Sematary, and then made $9.2 million in its third weekend, finishing fifth. In other territories, Dumbo was projected to make $80–90 million from 53 countries in its opening weekend, for a global debut of $137–155 million. Much like its domestic total, the film underperformed, grossing just $73.5 million for a worldwide total of $119.5 million. Its largest markets were China ($10.7 million), Mexico ($7.2 million) and Japan ($2.4 million). It made $39.6 million in its second weekend, for a running total of $137.5 million. On Rotten Tomatoes, the film holds an approval rating of 47% based on 321 reviews, with an average rating of 5.55/10. The website's critical consensus reads, "Dumbo is held partly aloft by Tim Burton's visual flair, but a crowded canvas and overstretched story leave this live-action remake more workmanlike than wondrous." On Metacritic, the film has an average score of 51 out of 100, based on 54 critics, indicating "mixed or average reviews." Audiences polled by CinemaScore gave the film an average grade of "A-" on an A+ to F scale, and those at PostTrak gave it 3.5 out of 5 stars. Writing for The A.V. Club, Katie Rife gave the film a "B-" and wrote "...characters are just there to keep the story moving, to provide awestruck reaction shots as we move from oddly muted spectacle to agreeable callback to the heartwarming happy ending. And yes, these are all symptoms of the same relentless conformist drumbeat the film is critiquing in its script. But what's more Disney than Disney controlling the ways in which a filmmaker can critique Disney?" David Rooney of The Hollywood Reporter wrote: "The hopes of diehard Burton fans might have been stoked by the recruitment of Michael Keaton and Danny DeVito, totems of the director's more consistent days. But this is another frustratingly uneven picture, with thin characters — human and animal — that fail to exert much of a hold, reclaiming the story only toward the end. Up to then, the filmmaker's overstuffed visual imagination and appetite for sinister gloom all but trample the enchantment of a tale that, at heart, is simple and whimsical. The central failure to recognize those virtues lies also in Ehren Kruger's cluttered screenplay." James Berardinelli from Reelviews called Dumbo "a perfectly adequate family film" and gave the film 3 out of 4 stars. The Guardian's Peter Bradshaw gave the film one out of five stars, lamenting that "Tim Burton's new Dumbo lands in the multiplex big top with a dull thud. It is a flightless pachyderm of a film that saddles itself with 21st-century shame at the idea of circus animals, overcomplicating the first movie, losing the directness, abandoning the lethal pathos, mislaying the songs and finally getting marooned in some sort of steampunk Jurassic Park, jam-packed with retro-futurist boredom." ^ a b c d e f g h i j k l m n o p q r s t u v "Dumbo Press Kit" (PDF). March 11, 2019. Retrieved March 11, 2019. ^ a b "Danny Elfman to Score Tim Burton's 'Dumbo'". Film Music Reporter. October 4, 2017. Retrieved October 4, 2017. ^ "DUMBO (2D)". British Board of Film Classification. March 15, 2019. Retrieved March 25, 2019. ^ a b Ryan Faughnder (March 27, 2019). "Disney's 'Dumbo' remake is expected to fly high at the box office". Los Angeles Times. Retrieved March 27, 2019. ^ "Dumbo (2019)". Box Office Mojo. Retrieved April 24, 2019. ^ a b "Dumbo Has Screened, See The Early Reactions". CINEMABLEND. 2019-03-14. Retrieved 2019-04-01. ^ Fuller, Becky (March 28, 2019). "All The Live-Action Disney Remakes In Development". Screen Rant. Retrieved April 1, 2019. ^ Weiss, Josh (March 26, 2019). "Does Tim Burton's Dumbo remake soar? First reviews say it's gorgeous, but lacks heart". SyFy. Retrieved March 26, 2018. ^ Ramos, Dino-Ray; Ramos, Dino-Ray (2017-07-26). "Tim Burton's Live-Action 'Dumbo' Adds 'Game Of Thrones' Actor DeObia Oparei". Deadline. Retrieved 2019-04-15. ^ ""Baby Mine" by Arcade Fire Featured in New 'Dumbo' Teaser". DSNY Newscast. 2019-03-05. Retrieved 2019-04-15. ^ Ramos, Dino-Ray; Ramos, Dino-Ray (2017-08-07). "Tim Burton's 'Dumbo' Adds Joseph Gatt To Live-Action Adaptation Of Disney Classic". Deadline. Retrieved 2019-04-15. ^ Buffer, Michael (2019-02-10). "Coming MARCH 29TH in theaters everywhere! TIM BURTON'S DUMBO (The Disney Classic is BACK!) "LET'S GET READY FOR DUMBO!" Sneak Peek @Disney @DAZN_USA @Dumbo #Dumbopic". @Michael_Buffer. Retrieved 2019-04-15. ^ Kits, Borys (July 8, 2014). "Live-Action 'Dumbo' in the Works From 'Transformers' Writer". The Hollywood Reporter. Retrieved March 23, 2014. ^ Ford, Rebecca (March 10, 2015). "Tim Burton to Direct Live-Action 'Dumbo' for Disney". The Hollywood Reporter. Retrieved March 23, 2015. ^ Max Evry. "Production Begins on Tim Burton's Live-Action Dumbo!". ComingSoon.net. Retrieved 16 July 2017. ^ Schaefer, Sandy (January 29, 2019). "Why Dumbo Isn't A Remake - It's An Original Story". ScreenRant.com. ^ Fuller, Becky (June 13, 2018). "The Dumbo Remake's Biggest (& Best) Change Is The Talking Animals". ScreenRant.com. ^ "Tim Burton helps new Dumbo film take flight". The New Paper. 2019-03-20. Retrieved 2019-03-21. ^ a b Kroll, Justin (January 11, 2017). "Will Smith Circling Tim Burton's Live-Action 'Dumbo' Adaptation". Variety. Retrieved June 17, 2017. ^ Fleming Jr, Mike (February 10, 2017). "'Dumbo' A No-Go For Will Smith". Deadline Hollywood. Retrieved June 17, 2017. ^ Knapp, JD (July 15, 2017). "'Aladdin': Disney Casts Will Smith, Mena Massoud, Naomi Scott". Variety. Retrieved March 26, 2019. ^ Kroll, Justin (March 24, 2017). "Colin Farrell in Talks to Star in Tim Burton's 'Dumbo'". Variety. Retrieved June 17, 2017. ^ a b c Uribe, Mariana (February 8, 2019). "The Cast of Dumbo reaveals What It Was Like to Work With Tim Burton". Oh My Disney. ^ Lodderhose, Diana (March 7, 2017). "Eva Green In Talks For Tim Burton's 'Dumbo' At Disney". Deadline Hollywood. Retrieved March 9, 2017. ^ Lodderhose, Diana (March 7, 2017). "Eva Green In Talks For Tim Burton's 'Dumbo' At Disney". Deadline Hollywood. Retrieved June 17, 2017. ^ Anderton, Ethan (March 24, 2017). "Colin Farrell May See An Elephant Fly in Dumbo". SlashNews. Retrieved June 17, 2017. ^ Busch, Anita (March 9, 2017). "Danny DeVito Negotiating To Join Tim Burton's 'Dumbo' At Disney". Deadline Hollywood. Retrieved June 17, 2017. ^ Pressberg, Matt (April 4, 2017). "Michael Keaton in Talks to Play Villain in Live-Action 'Dumbo' Remake". TheWrap. Retrieved June 17, 2017. ^ Ramos, Dino-Ray (August 7, 2017). "Tim Burton's 'Dumbo' Adds Joseph Gatt To Live-Action Adaptation Of Disney Classic". Deadline Hollywood. Retrieved August 7, 2017. ^ Ramos, Dino-Ray (July 26, 2017). "Tim Burton's Live-Action 'Dumbo' Adds 'Game Of Thrones' Actor DeObia Oparei". Deadline Hollywood. Retrieved August 2, 2017. ^ "Alan Arkin Joins Tim Burton's Live-Action 'Dumbo' (EXCLUSIVE)". Variety. 17 August 2017. ^ Giardina, Carolyn; McMillan, Graeme (July 13, 2017). "Will 'Avengers,' 'Frozen 2' and 'Star Wars' Dazzle at D23?". The Hollywood Reporter. Retrieved July 13, 2017. ^ "There Are Two Dumbos In Disney's Live-Action Movie". ScreenRant. 29 January 2019. ^ "Colin Farrell Explains Dumbo & Jungle Book's CGI Difference". ScreenRant. 29 January 2019. ^ "Dumbo Fun Facts" (PDF). March 11, 2019. Retrieved March 22, 2019. ^ "Dumbo - The Art of VFX". ArtOfVFX.com. Retrieved January 5, 2019. ^ Roberts, Maddy Shaw (February 7, 2019). "Dumbo movie 2019: cast, trailer, release date and soundtrack revealed". ClassicFM.com. Retrieved February 14, 2019. ^ Walt Disney Studios (3 March 2019). "Dumbo - Arcade Fire "Baby Mine" Reveal" – via YouTube. ^ a b "Tim Burton's 'Dumbo' to Feature End Credits Song by Arcade Fire". Film Music Reporter. March 4, 2019. Retrieved March 5, 2019. ^ "Arcade Fire's 'Baby Mine' Cover from 'Dumbo' Released". Film Music Reporter. March 11, 2019. ^ "Dumbo". AMC Theatres. Retrieved March 5, 2019. ^ Knapp, JD (July 15, 2017). "Tim Burton's Live-Action 'Dumbo' Lifts Off to March 2019 Release". Variety. Retrieved March 10, 2018. ^ Kirsten Chuba (March 12, 2019). "'Dumbo' Premiere: Colin Farrell, Danny DeVito Talk Working With Tim Burton". The Hollywood Reporter. Retrieved March 20, 2019. ^ Whitten, Sarah (2019-03-20). "'Dumbo' kicks off slate of Disney remakes ahead of Disney+ launch". www.cnbc.com. Retrieved 2019-03-21. ^ a b Anthony D'Alessandro; Nancy Tartaglione (March 26, 2019). "'Dumbo' Will Be Global Big Top Attraction With $137M+ Footprint". Deadline Hollywood. Retrieved March 26, 2019. ^ "Weekend Box Office Results for March 29–31, 2019". Box Office Mojo. Retrieved April 2, 2019. ^ a b D'Alessandro, Anthony (March 31, 2019). "'Dumbo' Doesn't Soar With $45M+ Opening; Matthew McConaughey At Bottom With $1.8M 'Beach Bum' – Early Sunday Update". Deadline Hollywood. Retrieved March 31, 2019. ^ Anthony D'Alessandro (April 7, 2019). "'Shazam!' Shoots To Super $53M+ Opening, $56M+ With Previews; 'Pet Sematary' Purrs $25M – Sunday AM B.O. Final". Deadline Hollywood. Retrieved April 7, 2019. ^ "International weekend Box Office Results for MARCH 29–31, 2019". Box Office Mojo. Retrieved April 2, 2019. ^ Nancy Tartaglione (March 31, 2019). "'Dumbo' Flies In Low With $71M Overseas; 'Captain Marvel' Nears $1B WW – International Box Office". Deadline Hollywood. Retrieved March 31, 2019. ^ "Dumbo (2019)". Rotten Tomatoes. Fandango. Retrieved March 29, 2019. ^ "Dumbo (2019) reviews". Metacritic. CBS Interactive. Retrieved March 29, 2019. ^ Rife, Katie (March 26, 2019). "Tim Burton's live-action Dumbo bites the corporate hand that feeds it". The A.V. Club. Retrieved March 26, 2019. ^ Rooney, David (March 26, 2019). "'Dumbo': Film Review". The Hollywood Reporter. Retrieved March 26, 2019. ^ Berardinelli, James. "Dumbo". Reelviews Movie Reviews. ^ Bradshaw, Peter (March 26, 2019). "Dumbo review – Tim Burton remake lands with elephantine thud". The Guardian. Retrieved March 26, 2019. Wikimedia Commons has media related to Dumbo (2019 film).